So here it is anyway, a look back at the quotes and stories from this week, three years ago. Enjoy. Mourinho to quit? Will he or won’t he? Not what I’d expected to write this week or indeed for quite a while, but what started as a suspected April fools joke on Friday has steamrollered into yet another media spotlight shining brightly on Chelsea, again not for the football but for matters off it, and again mainly focused on Jose Mourinho. Mourinho is understood to have demanded talks with Peter Kenyon and Bruce Buck over the club’s reluctance to appeal against the two match touchline ban imposed at the UEFA hearing last week. According to a source close to Mourinho, he’s furious with the club’s unwillingness to appeal over the ban and feels he has not been given the backing he deserves. He also feels that this isn’t the first time their silence has appeared damaging to him, the stories of Cole-gate and blood spinning still hanging over the club and Jose seem to be painted as the bad guy each time, not helped by the clubs lack of public backing. Chelsea confirmed last night that it won’t be appealing the UEFA decision, which also included a fine of around £9,000 for Mourinho, a fine of £33,000 for Chelsea and reprimands for assistant manger Steve Clarke and security official Les Miles. Mourinho is known to be a hands on manager, and wants to control all aspects of the club he manages. This doesn’t just mean the teams and transfers; it also includes the club’s media and communications policy. William Hill are offering odds of 9/2 that Jose Mourinho has ceased to be Chelsea boss by the first game of next Premiership, and 1/8 that he is still there. Chelsea are now 1/150 favourites for the Premiership, have already secured the Carling Cup and are 100/30 joint favourites for the Champions League. Jose Mourinho is also reported to have been offered the chance to star in his own chat show on Portuguese television. The 50-minute live show, to be carried on Portuguese broadcaster SIC, will be shown once a month, with the first programme scheduled for 18th April. Martim Cabral – SIC’s managing editor for news said; “The new show will be on at prime time. He’s willing to talk about everything except politics. We expect huge interest.” Also, it’s been revealed that Jose Mourinho’s famous grey trench coat is the work of Italian designer Giorgio Armani and NOT discount clothes chain Matalan. Did we really expect anything else? Chelsea club doctor Bryan English is to have talks with UK Sport, the organisation which administers drug testing in this country, in an effort to establish if blood spinning is a legal way of treating injured players. The method has been criticised by the World Anti-Doping Agency since it emerged that the Chelsea were using it to treat players to speed up rehabilitation after injury. Now it has contacted English, the former doctor for UK Athletics who is credited with helping Kelly Holmes overcome her injury problems, for talks. “This is such a new technique that we feel we have to talk to people about how it works and what the effects are” said a UK Sport spokesman. “The more we know about this method the better informed we will be to make a judgment on whether it is illegal or not.” UK Sport has advised players not to undergo the treatment because of fears it may be banned by Wada, leading to a possible two-year suspension for anyone found guilty of using the technique. It is expected that English will meet senior officials at UK Sport, including John Scott, the head of the anti-doping unit, within the next month. Roman Abramovich has dropped to second place in The Times rich list but he is still thought to be worth at least £7.5bn. Indian steel magnate Lakshmi Mittal comes out on top with a fortune estimated to be £14.8bn. The Rich List says the pair are now among 40 billionaires living in Britain – the biggest number yet recorded. Abramovich, Chelsea and Deportivo La Coruna are reported to be getting close to sealing an informal working relationship. Depor president Augusto Caesar Lendoiro is believed to have held talks with ’super agent’ Pini Zahavi, who is thought to be representing the Global Soccer Agency (GSA) about investment in Depor. Arsene Wenger incredulously called on Roman Abramovich earlier in the week to instil some ‘moral values’ on the club. “I think it would be helpful to hear from Abramovich. He sets the tone at that club. Of course, he is very powerful and they have the advantage of having rules which only they have,” he declared. “That’s why I think that the way he wants to lead the club is important for English football and the Premier League.” All this from the manager of a team with such renowned indiscipline and players with a bad attitude, remember the mass brawl at Old Trafford last season? Him calling Van Nistelrooy a cheat? His refusal to shake Sir Alex’s hand? Wenger – preaching about moral leadership? Don’t make me laugh Arsene! 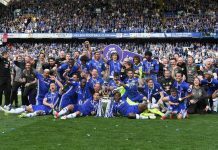 Yet another milestone has been reached this season, the victory over Southampton took us to the 80-point mark for the first time our 100-year history and it’s been rumoured that Chelsea have done very well in the nominations for the PFA player of the year award, with four of the six nominees Chelsea players. If this turns out to be true then it will be a first in the history of the awards. The nominees are rumoured to be JT, Lampard, Petr Cech and Arjen Robben, with Andrew Johnson of Crystal Palace and the goons’ Thierry Henry completing the six. The rumour suggests that Terry has finished first with Lampard narrowly second. Cech is reported to have taken third to give Chelsea an unprecedented one-two-three clean sweep. If true, John Terry will become the first Englishman since Teddy Sheringham to win what is considered a major accolade as its people within the game who cast the votes. So with Ferreira now on the injured list our defence is down to the are bones, we already knew a left back would be a priority this summer and the stories have come thick and fast. Zambrotta moved to end speculation on a move to Chelsea when he said; “I have a contract with Juve until 2008, being followed by big teams can only flatter, but I hope to stay for a long time at Juve and in Italy.” Chelsea are believed to be watching Asier Del Horno of Athletic Bilbao and Bilbao will not stand in his way should he decide to leave. Athletic President Fernando Lamikiz stated; “I will speak clearly with Del Horno and from his response the club will decide. We do not want to keep him at Bilbao if he is unhappy.” If Bilbao are ultimately pressured into a sale, they will look to bank the majority of his release clause which, under the terms of his contract, stands at €20 million. It seems Carlo Cudicini’s experience at Chelsea is slowly coming to an end as the keeper understandably wants first team football, something which he is not getting with Petr Cech in front of him. Chelsea will have a big say in where Carlo goes as his contract doesn’t expire until 2008, probably ruling out a move to an English club. Carlo said; “My destiny is decided by Chelsea. Roma is an idea which I like, just like all those which will allow me to play. I don’t even exclude an adventure in the Spanish league.” Carlo has also recently been linked with Milan. THE PREMIERSHIP – HAS ANYTHING CHANGED?